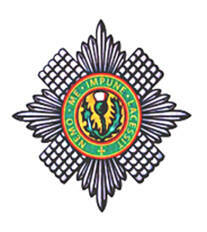 The Black Bear is the Headquarter Company March of the Scots Guards. The Scots Guards trace their origins back to 1642 when, by order of King Charles I, the regiment was raised by Archibald Campbell, 1st Marquess of Argyll for service in Ireland, and was known as the Marquis of Argyll's Royal Regiment. It spent a number of years there and performed a variety of duties, but in the mid-1640s, during the English Civil War, the regiment took part in the fight against James Graham, 1st Marquess of Montrose who was fighting on the side of Charles I. In 1646, Montrose left Scotland upon the defeat of the King in England. The Scots Guards is ranked as the third regiment of Foot Guards; as such, Scots Guardsmen can be recognized by having the buttons on their tunics spaced in threes. The regiment consists of a single operational battalion, which is currently (2007) based in Germany in the armored infantry role as part of British Forces Germany (due to move to Catterick by 2009). However, since 1993, the regiment has also maintained an independent company permanently based in Chelsea Barracks,London on public duties. F Company is the custodian of the colours and traditions of the 2nd Battalion, which was placed in permanent suspended animation in 1993. The Regiment marches past in slow time to “The Garb of Old Gaul,” in quick time to "Heilan Laddie" and advances in Review Order to “Scotland the Brave”.